Below is a copy of the Davis Patent Specification explaining the working of his invention. Perhaps these prior photographs with brief details on the mechanism's operation will help to understand how things work. 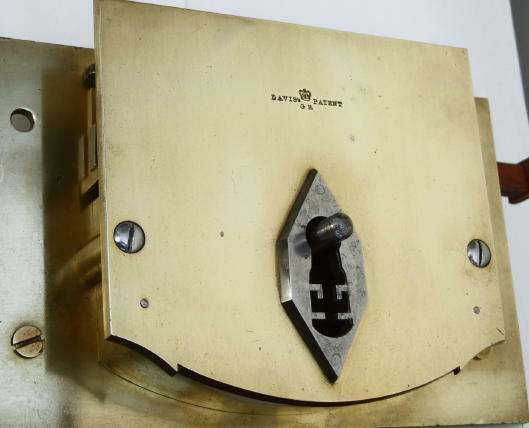 This below is a large brass lock that uses a latch instead of a normal bolt mechanism. The latch probably held a rod that was released when the latch is lifted and might have been used on a safe c.1800. If anyone can offer additional advice on this the information will be gratefully appreciated. Figure 1. 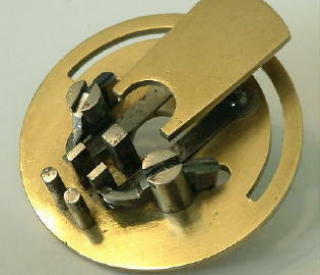 George Davis lock of c. 1800 showing the unusual ward system around the keyhole. On entry to the mechanism through the second set of wards (Figure 2) the bit has to fit onto the five vertical pin wards (Figure 4). On each side of them are two hinged metal pieces pivoted on springs. 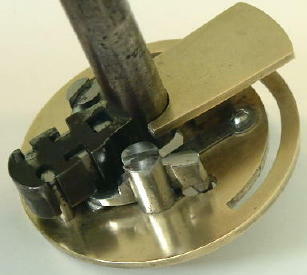 Their rounded ends fit into two holes on the lock base (Figure 6) and prevent the key from being turned until they are released. This occurs when the key is pressed down onto the hinged metal pieces (Figure 5) and their ends are lifted from the socket holes. Figure 2. (left) Shows the second set of wards between which the key has to be turned to pass through. Figure 3. (right) The latch instead of a normal bolt is shown, with the key bit inserted onto the springs. Figure 4. 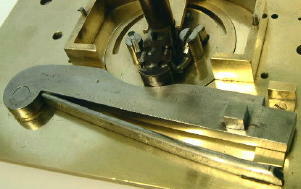 (left) The two hinged springs are shown either side of the ward pins onto which the key bit must fit and depress the springs. Figure 5. 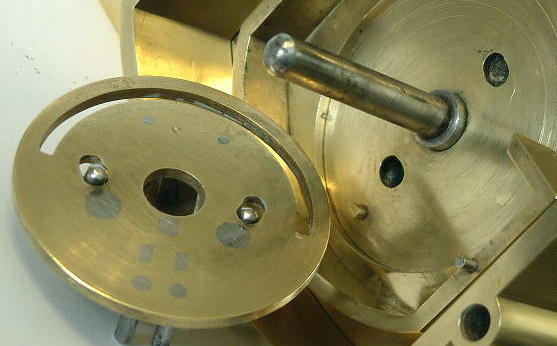 (right) The key has now been inserted and presses down, and lifts up the two hinged springs. Figure 6. When the springs are depressed their ends are lifted out of the two holes on the lock base where they were held. 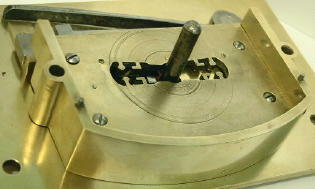 Then the circular disc and key is free to turn and open the latch. Davis also produced a number of case locks with counters for use by the British government as shown below. Note. Davis did not submit any drawings with the Specification appearing in the patent document.